What a treat! 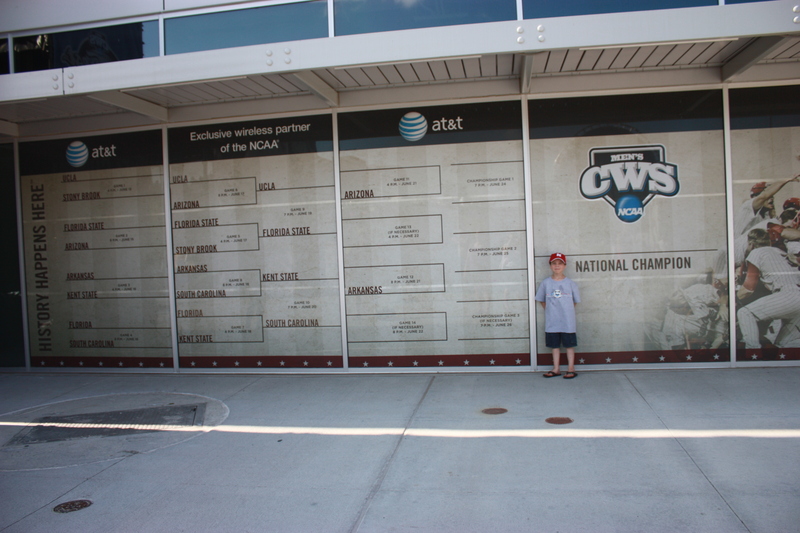 For Sam’s 8th birthday, his grandparents gave him tickets to a NCAA Men’s College World Series baseball game. I’d say this gift was a home run! We offered Maggie the choice of joining us or spending the night with her Grandma Cox, and she opted for the sleepover. 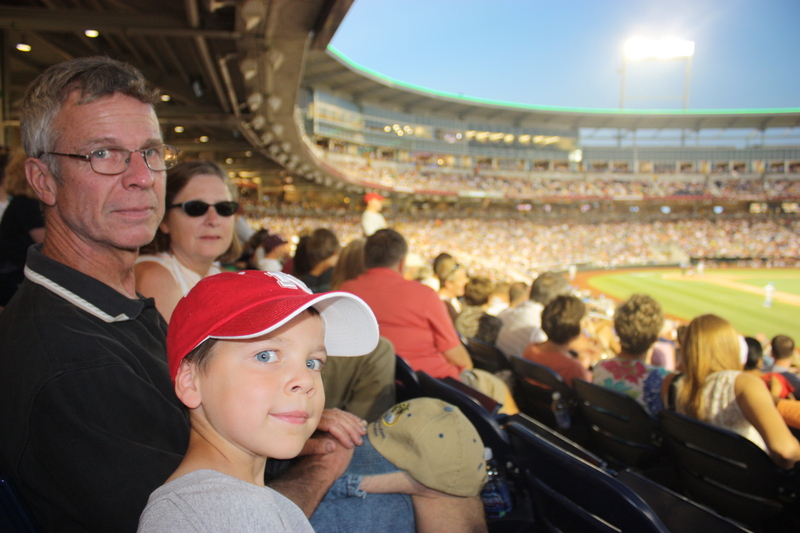 “I’m not such a big sports fan as everyone else in this family,” she declared. Wellokaythen! I’m not a huge baseball fan either, but it’s different when you can actually be at the ballpark. 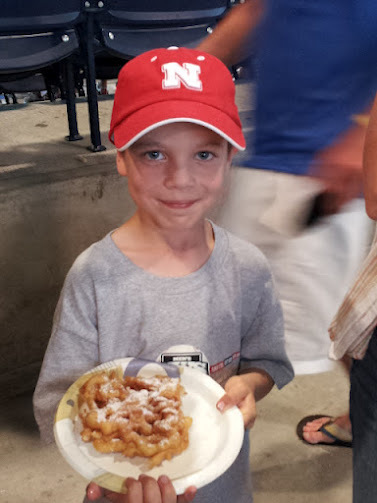 Where else can you simultaneously immerse yourself in the aroma of funnel cakes, popcorn, and hot dogs? Where can you watch crazy guys patrolling the stands, selling puffs of pink cotton candy and overpriced Dr. Pepper slushies? 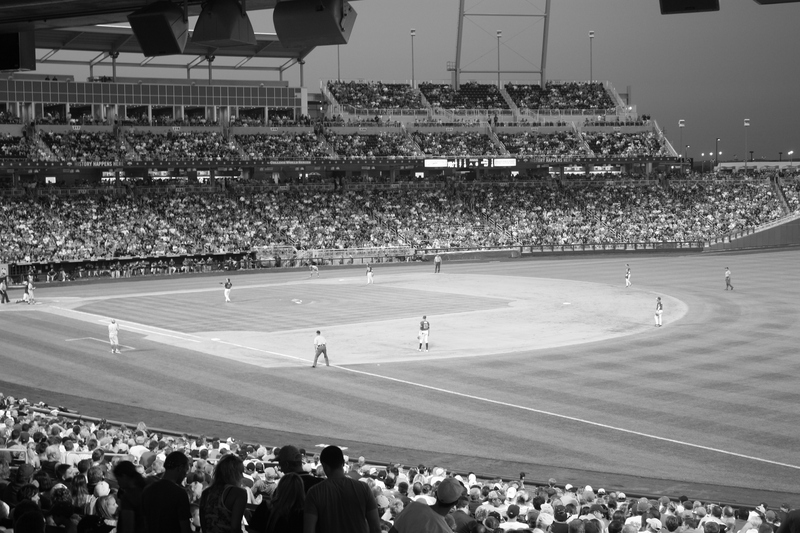 Or listen to a pipe organ belting out “Take Me Out the Ball Game” while the crowd sings and sways along? It’s good stuff. 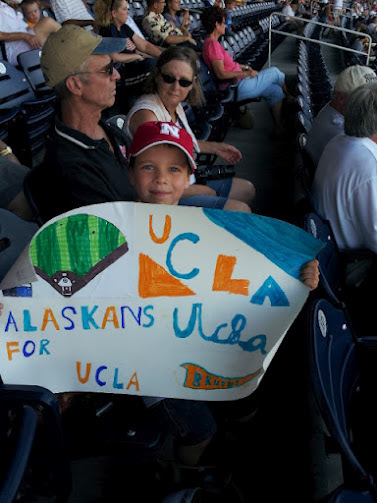 Once we learned which teams would be playing tonight (UCLA vs. Florida State), Sam decided who to root for and made a poster. He picked the losing team, but still got a few opportunities to wave his sign! Before the game there were kids’ activities galore where he could practice batting, shoot hoops, kick soccer balls, and more. The lady who ran the pitching machine must have thought he was too small, so she tossed him a few underhanded pitches herself instead. Imagine her surprise when he sent a line drive straight into her chest after the first pitch! 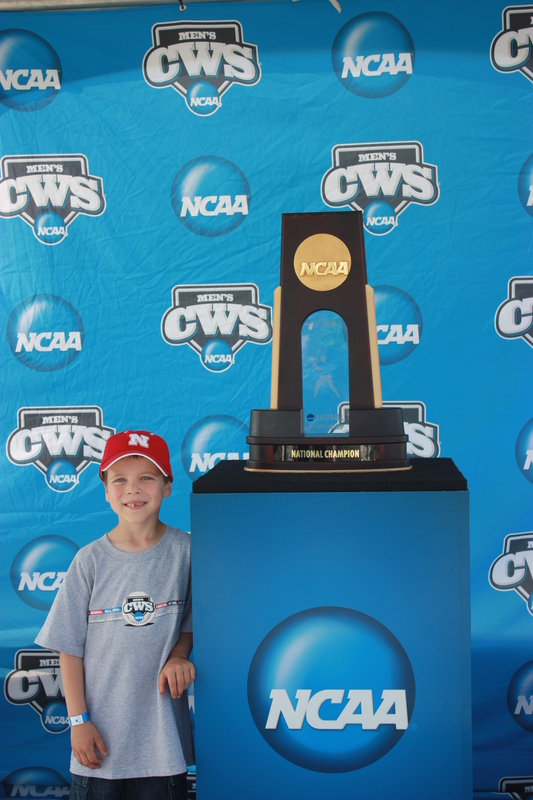 He even got to see the CWS trophy! We spoiled him with souvenirs and junk food. He got a t-shirt, pennant for his room, a little bat (Clark requested this), and I even let him eat an entire funnel cake. I should have bought him peanuts instead. We are still waiting for his front fang to fall out, and nuts might have been more conducive. 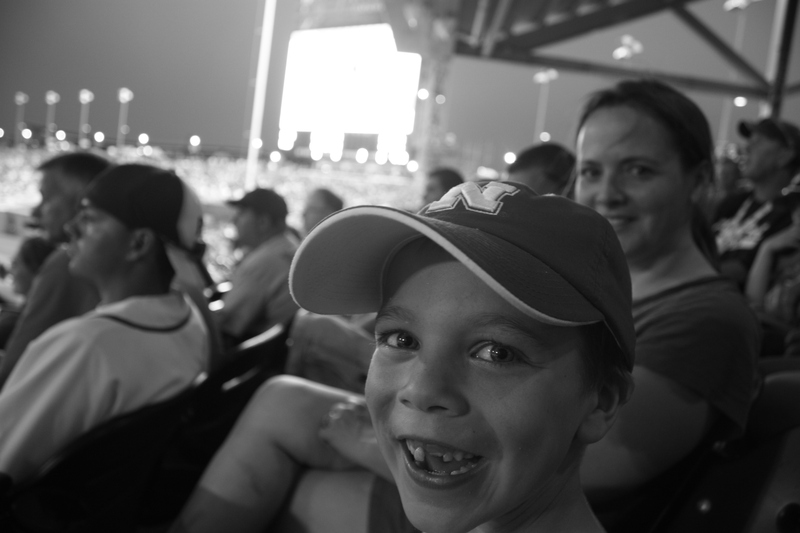 He still won’t let us touch the dangly tooth… it is getting ridiculous! All in all, it was a dream day for a happy boy. 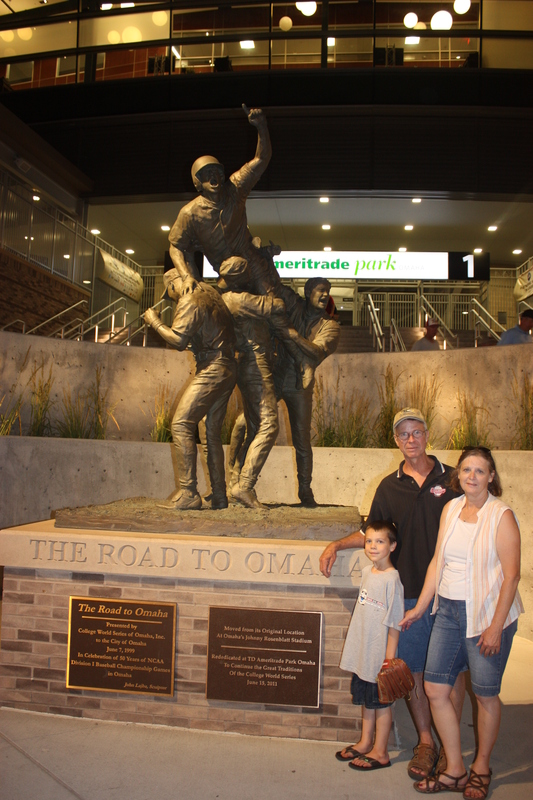 Thank you, Grandma and Grandpa, for the best gift of all: an experience, memories, and time spent together!